1. How many transistors were used in first microprossor-4004? 2. Define input and output device? 4. How many T-states are present in MOV M, B? 6. Name any two general purpose register in 8085. 7. Which signal is present in Vcc and Vss? 8. Write down any two example of data transfer instruction. 9. Write down the operation of MOV A, B. 12. What is serial communication? 14. Draw and explain the basic organisation of microprocessor. 15. Which bus is called bidirectional? Why? 16. Identify the total number T-states when the following instruction is executed? 17. What is flag register? How do we specify them? display the result at output port 01H. 19. Write any two application of DMA. 20. Draw a 9-pin configuration of RS 232. 21. Explain the process of data flow from Memory to Microprocessor (MPU) with suitable diagram. 22. Sketch the timing diagram of STA 2005. 23. Explain the addressing modes in 8085. 24. The following blocks of data is stored in the memory locations from xx55H to xx5AH. Transfer the data to the location xx80H to xx85H in the reverse order. 25. Write a program to find the smallest number in a data array from C001H to C005H and store result in COCOH. 26. Explain strobe I/O and Double Handshake I/O with necessary diagram. 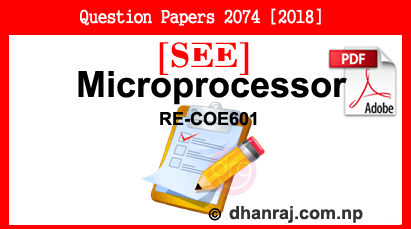 0 Response to "Microprocessor | Exam Paper | 2074  | RE-COE601 | SEE"